Everything you thought you knew about the small town of Eureka is about to change. Sheriff Carter (Colin Ferguson) and the resident geniuses are accustomed to the strange occurrences that make their town unlike any other. But when five of them are shunted back in time to Eureka's Founder�s Day their return trip delivers them to a present-day Eureka that�s anything but familiar. With new jobs new residents and new romances in store it's definitely not business as usual in this small town where the big secrets just got even bigger. Same town. Big changes. 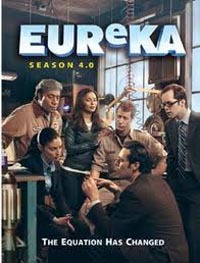 04: The Story of O2 - Allison deals with a major problem during Eureka's space week festival. 05: Crossing Over - Warehouse 13's Claudia Donovan pays a visit to Eureka, hoping to see some amazing technological wonders. She gets more than she bargained for when seemingly random objects begin appearing around town. Working with Sheriff Carter and Fargo, Claudia has to help solve the mystery before the strange anomalies have deadly consequences...particularly for newcomer Dr. Grant. 06: Momstrosity - Carter takes Kevin on a trip but a peculiar element threatens the trail of the not-so-happy campers. 07: Stoned - The rivalry between Carter and Grant for Allison reaches a new -and dangerous- level. 08: The Ex-Files - People from the past come back to haunt the lives of Carter and the gang. 09: I'll Be Seeing You - Grant's plan goes awry, landing him and Carter uncomfortably far away from home.